Winter brings a lot of perks such as holidays, more food, skiing, snow days, and so on but it also makes a number of problems for drivers. During the winter, you often have to scrape the ice and clean the snow off your vehicle before going to work. Does it sound familiar to you? Unfortunately, many of us have already experienced this in the cold winter mornings. Is there a cool trick to prevent this? A good snow car cover might be a right solution! Part 1: Why Do You Need a Snow Car Cover? One might say that the snow car cover is not necessary at all. While this may be true in hot climates where the winters are gentle and a heavy fall of snow is a rare occurrence, such a cover is highly beneficial in most of areas in the world. Just to mention some of the most important benefits of having this item. Apart from protecting the car from snow and ice, a snow car cover also protects your automobile against other hazards, such as acid rain, direct solar radiation, wind, dust, etc. There is a diverse range of car covers on the market to choose from. Some of them are made out of quality materials, whilst the others are shoddy and can barely last one season. Therefore, you must be smart when picking one for you, i.e. for your car. Let's narrow down the choice and focus on the four most used winter car covers. A metal carport is one of the most common ways of protecting a vehicle from the weather. 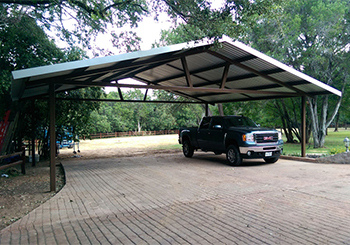 The steel carports are available in many different styles and sizes. Some of the most popular models are Boxed Eave style carport, Vertical Roof Carport, and Barn Roof Carport. 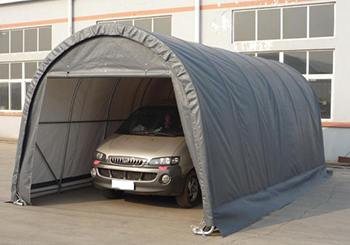 Though these covers offer a good protection for the cars, they are pretty expensive and occupy too much space which can be a problem for those with small yards. By the way, metal carports are not portable so that you can merely use them at one place. The next winter car cover you may take into consideration to protect your car in winter is a PVC car shelter. They are hardened with fiberglass rods and consist of various military materials, most of which are waterproof. PVC car shelters also come in different sizes and styles, including canopy sheds, inflatable car tents, polycarbonate plastic shelters, and so on. Another way to protect your car from snow and ice during the winter period is to park it under a wooden car port. Such a port may stand alone or be attached to other buildings. You can either purchase a montage wooden carport or build it by yourself. 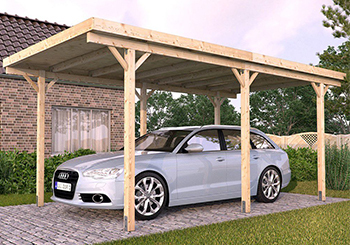 Compared to metal pots, wooden carports are easier to construct. That's because the wood features a lightweight structure which makes it easy to work with; it is also soft and thus easy to cut and shape. However, a wood port also has some disadvantages. Its durability is not as high as in metal carports, as the continued influence of the elements (such as wet weather, temperature fluctuations) leaves the notable effects on wooden ports. In addition, wood is inclined to rot, which is especially true for long lasting water buildup. Unlike the traditional winter car covers, portable car tents have the completely different approach when it comes to the car protection. Ine of the most innovative products of that ilk is Lanmodo portable car tent. Though it is primarily intended to make a shade in hot summer days, you can also get a lot of use out of this item in winter. This product is meant to be easy to handle and carry around, it weighs only 6kg (13.23 Ib) and has 85cm (33.46 inches) in length. It fits properly in any trunk and you can install it in 30 seconds. The strong wireless connection transmission opens in only 6 seconds and it can be picked up at 98 feet away. The umbrella holder is made using the high-quality material. Its extra smooth surface is safe for the surface of the car. By contrast to the traditional car covers, automatic car umbrella can be carried in the trunk, allowing you to protect your vehicle wherever you go. Just shake off the snow from the umbrella, pack it up in the trunk of your car, and keep driving!